After Aleppo: Will Trump Shift Syria Policy? 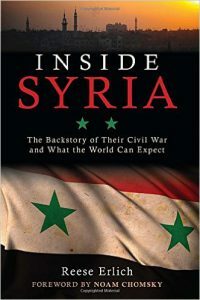 The paperback edition of Inside Syria: The Backstory of Their Civil War and What the World Can Expect (foreword by Noam Chomsky) has just come out. Erlich has reported from Syria six times and has visited all the surrounding countries. He is currently on a national book tour and is available for interviews after 8 a.m. Pacific Time.